MusicNation is a brand you’ll likely be sick of hearing about a few months from now. The company has built the destination site for a forthcoming super promotion by Clear Channel radio for an online music talent contest. That contest is sponsored by Epic Records, Universal Music Group, and EMI. The winners of the will receive recording contracts with Epic. Universal and EMI will cover Europe and Asia through the rest of the next year. There are any number of sites like MusicNation coming online, we’ve profiled karaoke contest site Bix, for example. Fox Interactive acquired kSolo.com for a rumored price of under $10 million in May. There are quite a few others, including SingShot and OnlineIdols. MusicNation does have a particularly well designed site (see screen shot below and on corporate page), I’ll give them that. I don’t think it’s going to work. EMI is the company making an other foray into new media with SpiralFrog, the company that will offer free music downloads that stop playing when you stop logging in to watch ads. Just like I expect of SpiralFrog, I expect that most young people will find MusicNation contrived and irritating. YouTube is having its own “battle of the bands” where the winners will go on Good Morning America and have their music turned into Cingular ring tones. I think that’s pretty corny, but at least there is already a huge community at YouTube – MusicNation is going to try and create one in a flash with an overload of advertising. The company is lead by Dan Klaus of BMG Canada, former DoubleClick CEO and now Shopwiki CEO Kevin Ryan and Ryan Nitz, past founder of DotComFailures and former roommate of FuckedCompany (and AdBrite) founder Phil Kaplan. (DotComFailures had a banner logo reading “kick ’em while they’re down!”) Heather Green calls them a startup media Web site in the forthcoming issue of Business Week – while that may be technically true, it rubs me wrong. 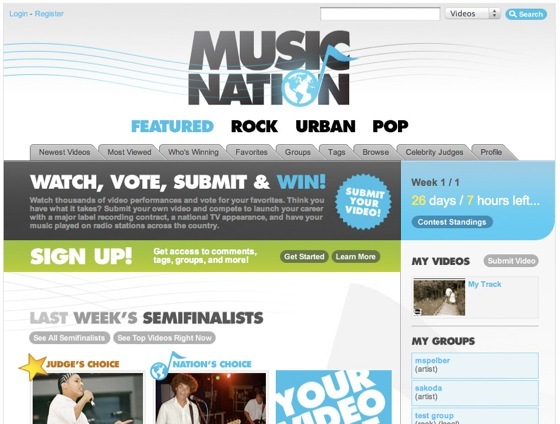 MusicNation says it will select winners by both viewer voting and a panel of “music industry influencers.” The company’s website says in one section that entry will be free, in two others that entrants will submit $25 with their videos to compete. In addition to a recording contract, winners will also appear on Clear Channel Radio’s in-studio performance series STRIPPED. The contest will run for 15 months. Also on the MusicNation corporate site is a section titled “blogger relations,” where you can get a linked button and contact the company. Don’t all rush to get those buttons at once. Epic told Business Week that they put in less than $1 million to participate and hope that it will be a wildly successful effort. MusicNation is represented by global PR giant Hill & Knowlton so someone’s throwing down a whole lot of money. Hill & Knowlton was the firm that infamously staged US congressional testimony by a young woman posing as a disinterested witness to the Iraqi government allegedly dumping babies out of incubators in the lead up to the first Gulf War. In the end the young woman was identified as a daughter of the Kuwaiti ambassador to the US. Three global record labels, a group of music suits and the guy from DotComFailures spewing almost four months of ads written by Hill & Knowlton on ClearChannel for an online talent show with a $25 entry fee? Sounds like a recipe for a whole lot of cringing and backlash to me. Will they ever figure it out? The big guys should do the big guy thing (with integrity) and leave the grass roots efforts to the DIY crowd.